Okay, so I’m an idiot. Not for the multiple reasons that my wife might list, but because after 50-plus years living in the Frozen Northeast, I have just now discovered the awesomeness of riding a dirtbike on ice. Add to that the fact that I have lived on a perfectly good lake for the last 25 years and you can see the reason for my self-criticism. Okay, I can probably be forgiven for not riding a motorcycle on ice, after all, it does seem a little crazy. And I’ll admit to being super-intimidated the first time I rolled my 2010 Kawasaki KLX250s onto the previously liquid, but now molecularity-hardened surface in front of my house. But, I’d seen the photos of others leaning at insane-degree angles on frozen bodies of water, so I figured that with my newly-mounted Fredette Canadian ice tires, I just might be okay. My first time on the ice: scary and exhilarating. And so I was. As a matter of fact, I was more that okay, I was absolutely beyond okay! After a few tentative laps around the rock-hard lake, I was giggling like a schoolgirl on Nitrous. 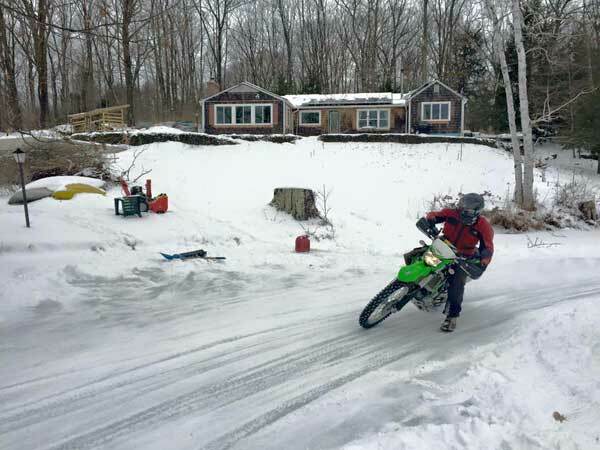 So, as much fun as ice riding is, it also offers big benefits to my off-road riding, as well as my street and racetrack pavement riding. Becoming more comfortable with managing variable amounts of traction. Learning to look through turns even when traction is breaking loose beneath you. Seeing just how much throttle control affects traction. Understanding the importance of proper body position for off-road riding. Learning to relax even when you’re on the edge of control. Feeling more and more comfortable “backing it in”. Each of these things apply to general motorcycle riding, with some lessons being more applicable to dirt riding and ultra-fast racetrack riding. As a street rider, ice riding widens experiences and expands the margin of error for those times when the unexpected happens and survival means keeping your cool. Ice riding is a lot like dirt riding especially, flat track, and is all about taking advantage of the grip the tires offer. Lean the Bike Beneath You: Ride on top of the bike when cornering, sitting on the upper edge of the seat with the bike leaned sharply underneath you. 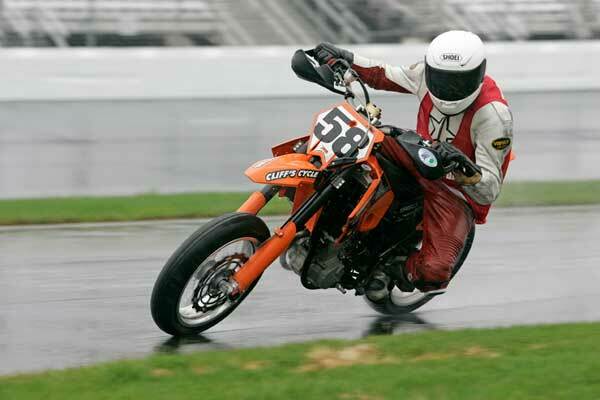 Avoid leaning to the inside like you might do when street riding, track riding, or roadracing. Arms: Extend your inside arm while keeping your upper elbow up high and bent. This is tiring and hard to remember, but really helps with front tire traction and control. This arm position means you will hold the throttle like a screwdriver when making left-hand turns (most ovals go counterclockwise, like flat track racing). Sit forward: Sit on the very front of the seat so the bike’s pivot point is centralized. Feet: Weight on the outside footpeg to maximuze traction. Drag your inside foot on the ice as a third contact point. Be careful not to put too much weight on the foot to avoid hooking it on rough ice and cause it to get trapped under the rear tire. Ouch! Look: Keep looking through the turns even when it feels like all hell is breaking loose. Like all other motorcycle riding genres, this helps you relax and let the bike sort itself out. 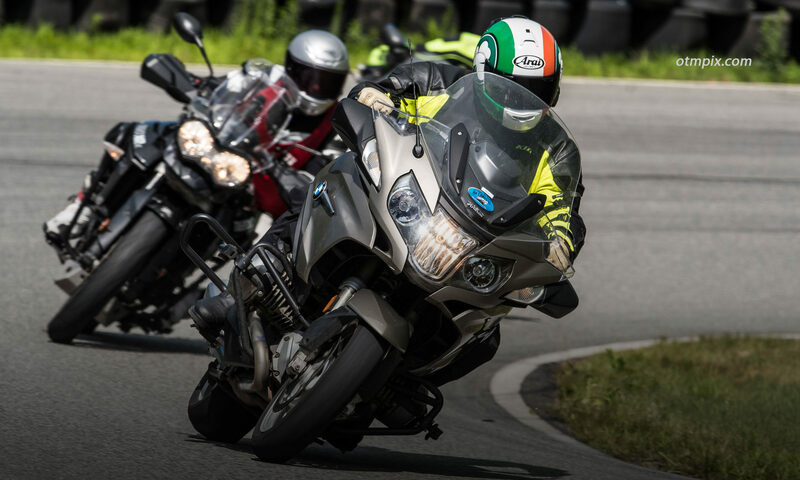 Steer with the Rear: As you get faster, you learn to back the bike into the turns. This gets the bike turned with the rear, rather than “steering” with the front, which can increase the risk of the front sliding out. Steering with the rear can be done by using a bit of rear brake as you enter the turn, or by downshifting and dumping the clutch. If you are going real fast then a hard countersteer will break it loose. Whether you use the brake or not depends on the amount of grip the ice has. Buy a few bags of special screws from a motorcycle or ATV retailer and spend time with a cordless drill installing hundreds of those little buggers into your knobs. One popular brand is Kold Kutters. Buy already prepared ice tires. The ones I have are from Fredette Racing Products. They sell tires with “AMA approved” screws, as well as the more aggressive Canadian type. Buy tires pre-made by local ice riders. Ask around. The Canadian tires I have mounted carved right down to the hard icy surface on powder snow and are pretty decent even after the ice becomes shredded into fine chips. The AMA tires don’t have nearly as much grip on soft surfaces. I know this from riding a borrowed 125 motocrosser with AMA tires (see photo). You’ll want to get some tire wraps to keep the screw’s sharp when rolling the bike around the garage and loading in your truck or trailer… and prevent bloody hands. My bike is a bone-stock KLX250s, which handles just fine for fun, but needs more power, especially for the larger lake ovals. I’m about to install a 351 big-bore kit to solve this problem. More serious riders set up motocross bikes with ice fenders and lowered suspension. What to wear? I saw all sorts of riding garb when I recently rode in New Hampshire with a group of friends. It was 10 degrees F, so naturally we were bundled up. Some riders wore dirt riding pants and regular winter jackets, some wore Carhartt jackets and pants or snowmobile gear. Helmet: I wore both my spare street helmet (full-faced, of course) and dirt bike helmet with goggles. Shield fogging can be an issue, but cracking it open a bit solved the problem…mostly. Snowmobile shields are another option. A skull cap under the helmet helps keep the head warm. Boots: Some people wear heavy winter boots and some wear off-road boots (including me). One thing to consider is that you need boots with soles that are durable enough to slide across rough ice all day long. Wear warm socks. Gloves: My hands are susceptible to the cold. On days that are a bit warmer, I rode with insulated mechanics gloves. However, on the 10-degree days, I wore my insulated street gloves with glove liners. Note that wearing gloves that are too thick can lead to arm pump. Layers: Wear layers! You will get warm enough to sweat and will want to shed a layer or two as the day goes on. I wear three or four layers of performance nylon shirts under a street riding jacket. Pants: I wear an old pair of MotoPort overpants over jeans with motocross knee armor underneath. Armor: Speaking of armor, I highly recommend you get armored-up. That ice is hard! In addition to knee armor, I have elbow guards, hip pads and my Impact Armor back and chest protector that I use for roadracing and track days. So, where does an ice rider ride? In New England, there are people who make the effort to drive their plow trucks to the lakes to clear ovals and road courses of various distances. And I’m sure there are plenty of places in other parts of the Northern U.S. with dedicated riders willing to clear lakes and ponds for others to ride. Get online to find out where ice riding is available in your area. Please be considerate of those who do this fine work. Ask if it’s okay to ride before showing up and be sure to clean up after yourself. If you’re the competitive type, you can always step up your game and go racing. I’m not a resource for ice racing, so do a Google search and ask around at dealerships and on Facebook. You experienced ice riders, please share any more tips below. Good luck and Back it in! Riding on the ice is such a great way to extend your riding season and hone some new skills!!!! Great write up Ken!!! Great story, any ridng genre that allows us to practice “traction management” is tops in my book, thanks for the tips! Great Article! It is not too often I see a write up start with “Okay, so I’m an idiot.” lol. Definitely have to check Ice riding out and add to my 2 wheel skills. I agree that armor is a good idea. Last week, I didn’t wear armor and low sided a few times. (Yup, that’s me in the picture above.) At the time, I didn’t feel the pain, as the adrenaline masked it, but for the next few days, my elbows and knees were sore. I went back out today, and this time wore my knee pads and vest which includes elbow pads. Now, I think wearing armor is a bit like having rain tires ready, it prevents what you are getting ready for from happening as I didn’t hit the deck this time. Thankfully wearing the armor didn’t hinder my movement so I will be wearing it from now on. Thanks for suggesting armor Ken! A wise man you are, Roland. I fell twice last weekend and my upper thigh got the worst of it. Even with armor DIRECTLY over the impact point, I was sore the next couple days. Where your armor, people! FYI, I’m in the process of creating an article on KLX250s upgrades, including installing the 351cc big bore kit from Blue Bill. Search for it. Like the author, I too have just started ice riding after many years of riding. I’ve gone twice so far and am going this coming weekend, it’s really a blast! A couple of things I’ve picked up is profesionally prepared tires are worth every penny spent on them and that any flat track or American Supercamp experience directly applies to riding the ice. I’m stuck here on Long Island and have to travel pretty far to ride ice, does anyone know of anywhere close to or on LI that I can ride? Anybody here try a sports bikes on ice? Curious whether it’s worth it or not. Some people have done that. Look on UTube for videos of it. As goofy as it may be, Connecticut laws require an ATV plate & registration to ride on a Connecticut frozen lake. My son and I learned the hard way several years when we were riding on the frozen lake across the street from us and had a DEEP cop walk out on the ice to stop us and give us tickets. Back then they were using spotters in aircraft with an officer on the ground to patrol the lakes. 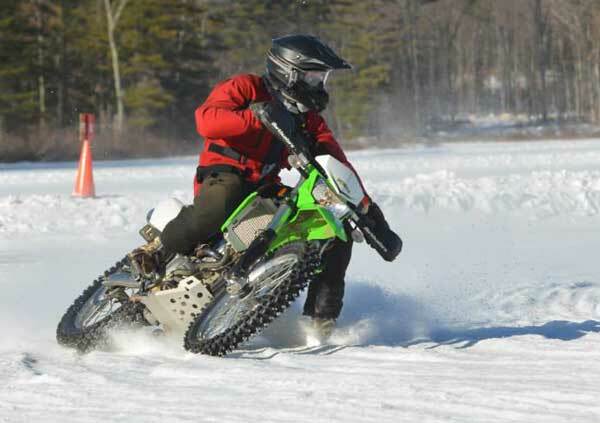 Organized ice races for motorcycles and ATVs are held in Sturbridge at the Hamilton Rod & Gun Club’s pond. Another good way to begin building skills for ice riding is to take a rear wheel drive car or truck to an empty parking lot when it is snow covered. You can practice controlling slides, throttle steering, and traction management that way. 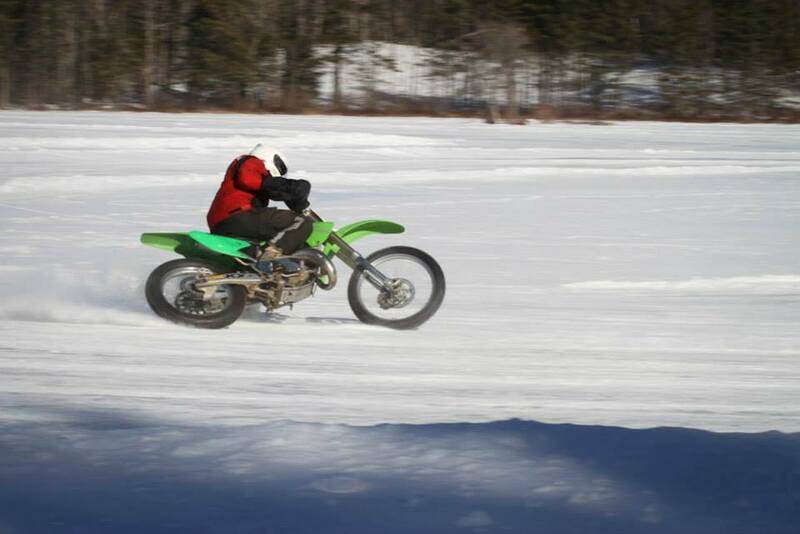 Then when you go on a frozen lake with an ice tire equipped bike you’ll have a head start on building your power sliding skill. The ice is a great place to develop power sliding skill. Another gear related idea learned waaaaay back in the 70s is putting a few of your ice screws into the heels of your boots. There will be days when there is no snow on the ice and just very slippery glare ice. If you fall and have to stand on one leg while you swing the other leg over your bike to get back on, or need to get off the bike and walk on the glare ice those screws help a lot. The Keystone Cop situation of having your leg slide out from under your body as you swing the other over your bike is frustrating, but pretty funny, too. The cartoon image of slipping on a banana peel fits.